As you may have noticed we’ve been focussed on local harvests recently and there has been no greater promoter of local produce and producers around Canberra than chef Janet Jeffs over at Old Parliament House. Her latest Kitchen Cabinet lunch was focussed on local cheese producers. All three types of cheese, cow, goat and sheep, were represented at the lunch by three local producers – Small Cow Farm (cow, from Robertson in the Southern Highlands), Hobbit Farm (goat, from Jindabyne) and Thistledown Creamery (sheep, from Goulburn). It was clear from the outset that no matter how they came to cheese making that all the producers were passionate about what they were doing. As is the usual format at Kitchen Cabinet events there was a presentation by the producers as part of the proceedings, before we got down to the business of eating. One thing that all the makers stressed was that like other foods milk is a seasonal product. Sure, large scale dairy farms rely on methods of staggering their production to get year round milk, but artisan cheese producers are relying on female animals having a a calf, kid or lamb at foot to produce the milk for their products. So don’t be surprised if your favourite artisanal cheese is in limited supply sometime during the year. 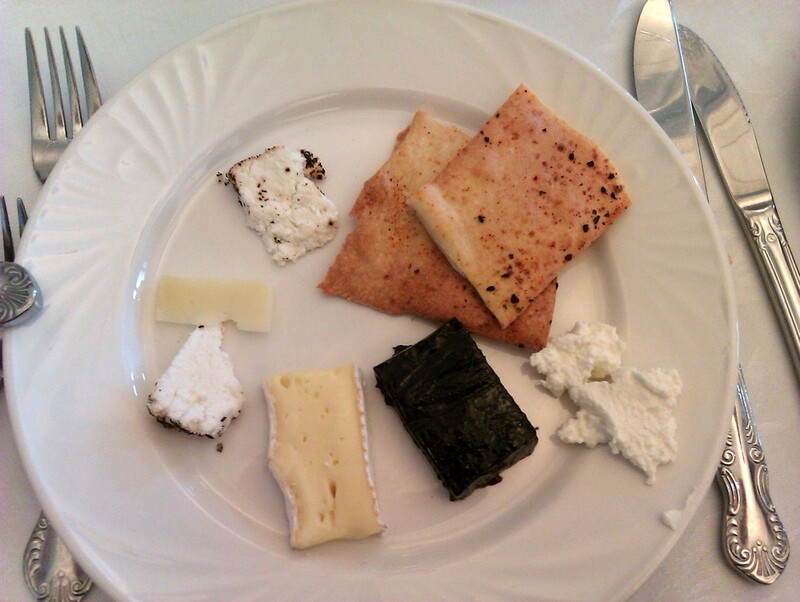 Lunch started off with a tasting plate of cheeses from all the producers and a piece of truly delicious paste made by Janet (the dark rectangle on the plate). I particularly liked being able to compare the salted and un-salted fresh goats cheese (one of which is on the RHS of the plate) with the mature goats cheese. We also spent a bit of time debating the content of the accompanying fruit paste, plum possibly or maybe a wine paste. Having asked, it turned out to be a combination of crab apple and apple which Janet and her staff had cooked up in the kitchen over several days. Between entree and main, we had the chance to ask questions of the producers. There was quite a bit of debate about raw milk cheese production, a debate which clearly isn’t likely to be resolved in the near future. I think the most useful point that came from the discussion was that we shouldn’t be equating pasteurisation with ‘boiling the guts out’ of the milk. For artisanal cheese producers the process tends to be one of heating the milk to the lowest acceptable temperature over an extended period of time to achieve the result (sorry you’ll need to look up some cheese making recipes for the specific details) as opposed to the larger manufacturers which achieve pasteurisation by exposing the milk to a much higher temperature for a very quick time. The reason the small producers use the ‘low and slow’ approach is that it helps maintain the taste of the product. We fell on our main course of twice-baked souffle, goat cheese roasted tomato and thyme and fetta, beetroot, walnut and blue cheese salad, tatziki and spiced labneh, so quickly that I forgot to take a photo (sorry). It was absolutely wonderful. I did manage to get a shot of dessert which was Quark cheese cake with berrie compote. For the uninitiated, like me, Quark is a type of German fresh curd cheese. It didn’t last long either! While I certainly enjoyed the the cheese we ate on the day I came away from the event with a lot of questions about artisanal cheese production in Australia. Firstly it’s hard to get a handle on the scale of the Australian small/artisanal cheesemaking industry. Clearly there are quite a number of small scale producers setting up all across the country (as we found travelling in Tasmania), but confusion reigns, statistically that is, because many of the larger commercial maufacturers also consider themselves to be ‘small’ producers (which they probably are compared to cheese producers overseas). Putting to one side the raw milk debate, the high level of regulation of the dairy industry adds a significant level of challenge to anyone thinking of producing cheese commercially. Even to get your dairy up and running is a major challenge, let alone being able to produce high-quality products. Clearly increasing the public’s demand for quality artisanal cheese is a complex process that is not without its hazards for the producers themselves. Greater demand puts higher stresses on the makers. Small Cow Farm, for example, has moved from producing cheese from its own herd to buying in milk from nearby herds, as the time demands of milking and producing cheese became too great for their operation. Meeting safety regulations, including rigourous testing regimes, requires a significant amount of any cheesemakers time. If you’d like to read Nick’s report in full you can find it here. All I can say having just quickly looked at some of the complexities of producing good artisanal cheese it hat’s off to them all, they must be mad! 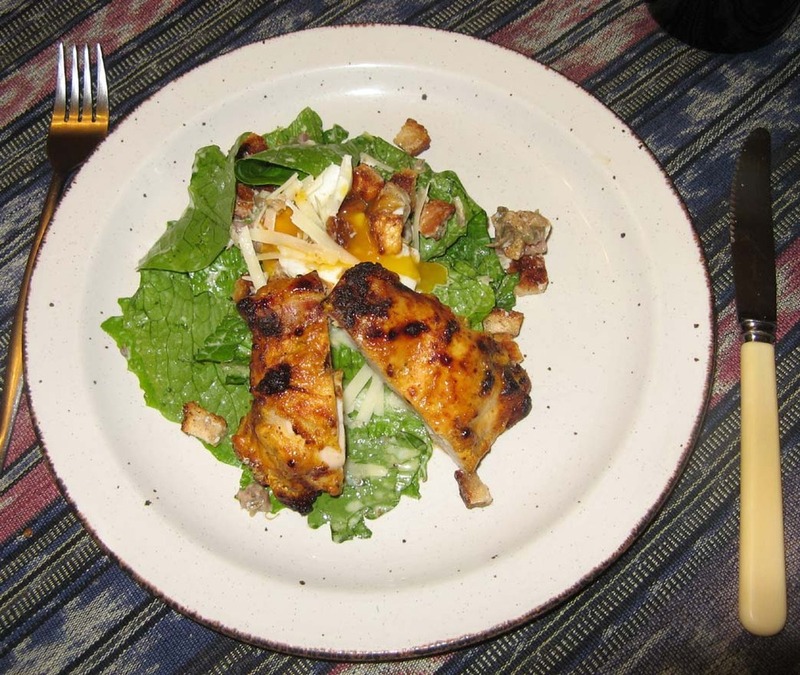 PS Thanks to R for providing the photo of the entree. 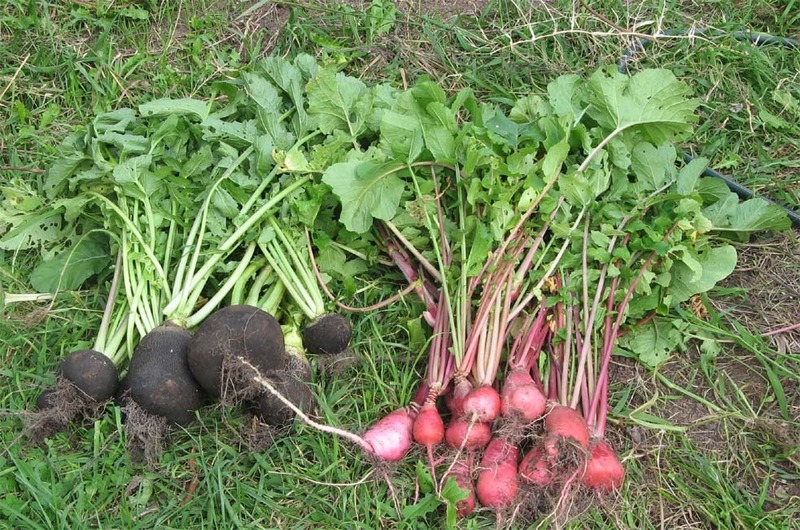 In late December I planted three rows of radishes as a gap filler before our winter planting. We’d eaten the French Breakfast radishes pretty quickly, but I got put off the Winter Round Black radishes by their really pungent taste. I can’t even remember eating the China Rose radishes. After a few weeks I pretty much forgot about them. Last weekend I decided that it was about time I dug the radishes up and dealt with them. I wasn’t expecting much as my previous experience with old radishes was completely un-edible. However I certainly got a surprise with this lot. Not only was there was a decent harvest, but some of them were absolutely gi-normous! The largest one in the photo weighed in at 685 grams. OK I certainly wasn’t going to eat all of these in a hurry so I decided to try a recipe from my new book on canning – Canning For a New Generation by Liana Krissoff (canning is what making preserves is called in the US). Liana’s blog can be found here. 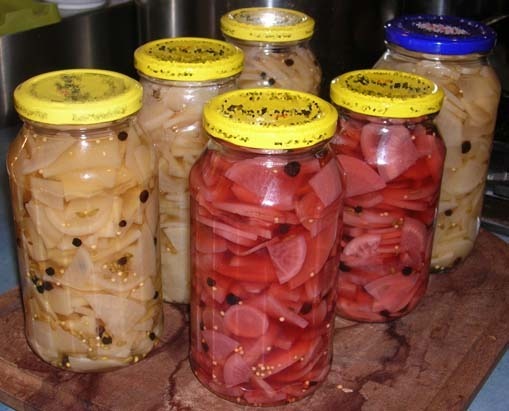 The recipe for Pickled Radishes was the one that caught my eye. I even had a hopefully willing target for the food as Variegated was visiting for lunch the next day. Now one day is not long for a pickle that I’m pretty sure will develop a more mellow flavour over time. TB had the great idea of cutting its currently sharp vinegary taste with some of our freshly-picked feral apples. Not only did the sweet crisp fruit balance the vinegar to perfection, but the pickles also helped cut through the luscious flavour of TB’s terrine of pork and veal liver. 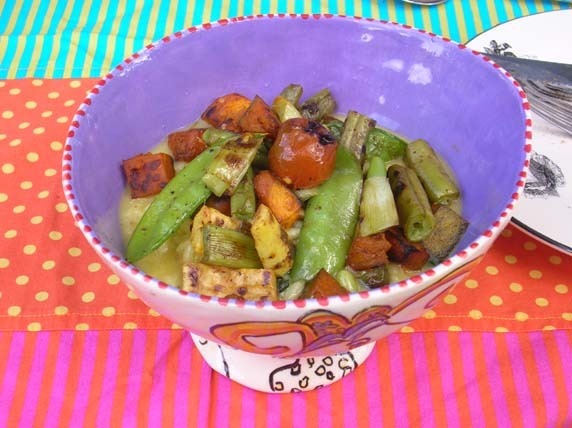 The main dish was an autumn risotto of garden veggies. The flavouring was our own saffron which this year has been producing a steady, if small, crop of stamens. The colour of the saffron is rich and the aroma of the infusing stamens is even better. Here is the finished dish. We all enjoyed eating this meal out in the back garden, experiencing one of those wonderful Autumn days which we have been so blessed with over the past few weeks. Well after the excesses of yesterday’s dinner we were after a smaller more relaxed set of meals today, starting with a simple bowl of breakfast cereal. Our cereal is put together with lots of different grains from our local health food store and includes our own dried apples (feral picked) and persimmons (from our friend’s Mum’s garden). Feral apples picked in February just over the ACT border. After breakfast and a stint at the gym we wandered over to the Belconnen Markets, specifically to buy fish, only to discover the fish shop was closed. We consoled ourselves with a almond croissant and cup of coffee from the patisserie instead. We did, however finally get our Country Valley organic milk which is produced in Picton (outside of Sydney) and is the closest organic milk we can find. Lunch was a very relaxed affair eaten sitting outside, enjoying our garden and the glorious autumn weather (it’s a real improvement over this year’s soggy summer). Something simple to eat. Toasted cheese (C2 again, the last bits) and our late cherry tomatoes and basil with some bechamel sauce. Washed down with some homemade lemon cordial (lemons from our friend’s tree). After lunch I got stuck into pickling our remaining radishes. I had plenty of China Rose and Tondo di Nero varieties. Enough to make quite a bit of pickle as it turns out. 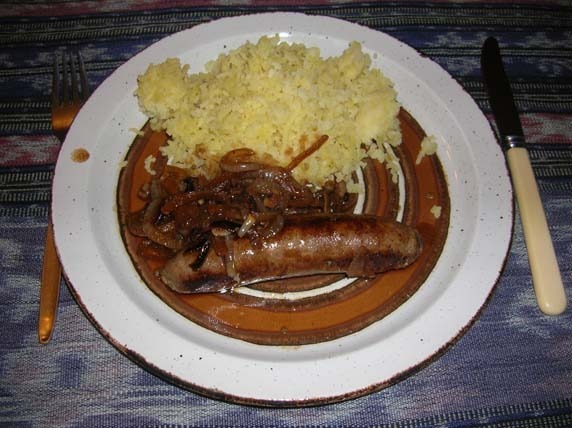 Dinner was a very simple affair, bangers and mash. TB had made the sausages, in this case beef with North African inspired spices, during the week. The potatoes came from the back garden and the onions came from a shop. A pleasant end to the challenge. Oh wow, we had something different for breakfast today! Fruit bread, or more precisely Hot Cross Bread. This loaf, which was homemade(by our bread machine, includes some of our candied quince from last year (not sure but I think we bought those quinces). The only drawback is that it wasn’t meant to be a loaf. It was intended to be dough for Hot Cross Buns. Unfortunately there was a setting malfunction – we’ve only had this new machine for a few weeks – and we came into the kitchen to discover the ‘dough’ was being well and truly baked. Oh well. Lunch was toast (homemade bread) topped with the csabai sausage (farmers market) and the last of our Bruny Island C2 cheese (definitely not local but marvellous just the same). Tonight was our ‘Dinner Night’ in which more or less the same group of 10 people (plus sundry children and visiting relatives) get together for a shared meal. This has been happening for over 20 years. Our theme for the night, set some months ago, was ‘Royalty’ (not Local Harvest which would have been more appropriate). So it was really only us who did the local thing. TB made his Warrigal Green souffle (warrigal greens from our garden), styled on a spinach souffle that HM QE 2 is said to favour when she doesn’t want to eat sweet desserts. This is the same souffle he trialled for us on Day 2, with the added bonus of a cheesy Stilton Sauce, which while homemade didn’t include any particularly local ingredients. 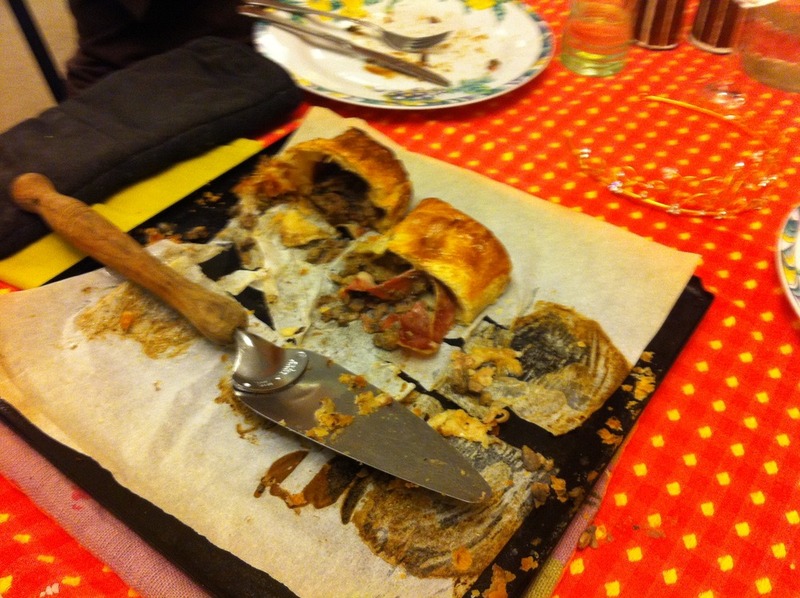 Our most spectauclar main was a Beef Wellington, but as you can see in the heat of the moment only the last crumbling, but tasty, remains were captured on one of our guests iPhones. 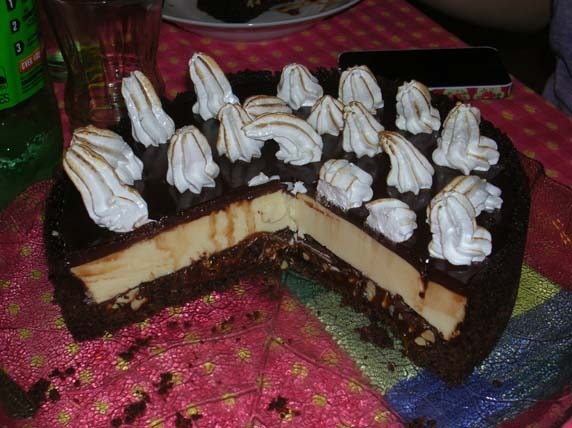 I was on the dessert roster along with some amazingly rich offerings including this Meringue-crowned chocolate cheesecake (from the latest Woollies Good Taste magazine). My serving was rather more restrained, (OK I’m jealous), a Victoria Sandwich Cake with appropriately royal styling. The one on the left has our homemade Blackberry Jam (feral picked blackberries) and the one on the right has the Dandelion Marmalade on top (see Local Harvest Day 1). The crown shape is courtesy of one of my favourite op-shop finds, this crown moulded cake tin. It’s a fun design, but a bit of a bugger to get the tin lined and the cake de-moulded in one piece. It turned out there was so much food that I’ve been able to save the second cake for an afternoon tea I’m attending on Sunday. Just one more challenge day to go. Breakfast – the usual suspects, but lunch was a treat. TB had bought a large piece of beef rump from the local butchers and had broken it down into portions for us and some for our very spoilt cat. Yesterday he ground up some of the beef to make hamburgers for lunch. The burgers were served with our own lettuce and a broad bean paste, made from our own beans. Now don’t go turning up your nose. If you know how to cook them broad beans are really tasty. They were a real bonus on this dish. (Sadly we forgot to take a photo of the hamburgers). Dinner was Italian Turnip soup. I used my whole crop of turnips – well the 4 that survived multiple snail attacks to reach maturity that is – in this dish. 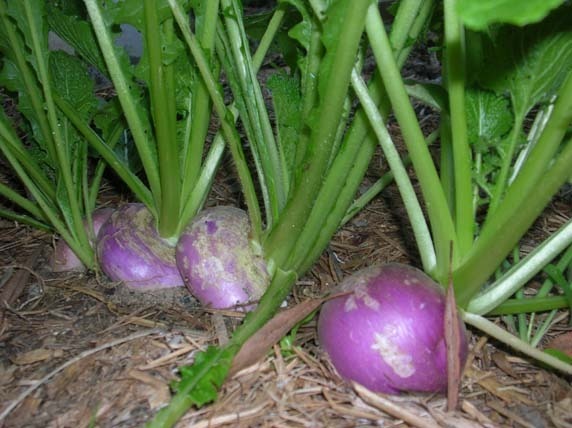 This turnip variety is called Rouge Flat Hatif (from the Vilmorin seed company) and when I had a small taste turned out to be quite peppery, not dissimilar to our radishes (which given that radishes, like turnips, are also a member of the brassica tribe shouldn’t surprise me). These turnips were destined for Italian Turnip Soup a dish I have made once before.The soup is very simple just turnips braised in butter and oil, subsequently cooked in a good stock, thickened with a half cupful of arborio rice. I think the first version I made of this soup, using ‘normal’ ie widely available English white round turnips, was definitely sweeter. Not that the flavour of this version was unpleasant, just different. I suspect that these turnips would be much tastier served as a Japanese style pickle. 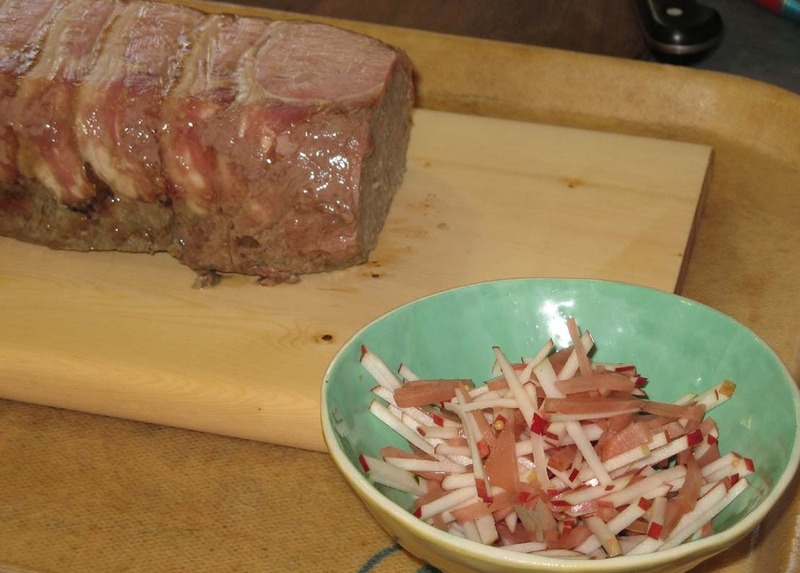 I’m thinking that the recipe I used to make radish pickles would work just as well for turnips. Boy I think the hardest thing about this challenge is keeping up with the blog posts and remembering what we’ve eaten every day! Breakfast – you know the drill – toast and homemade jam. 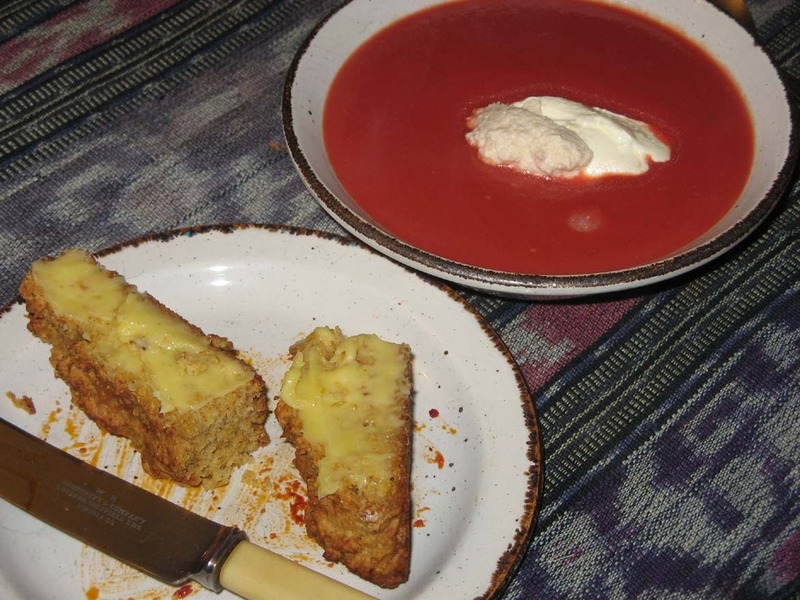 For lunch I finally got to my left-over beetroot soup with cornbread from Day 2, just as good the second time around. I realise I’ve been forgetting to write about the snacks we’ve had for morning and afternoon tea. These have been mainly muffins/cupcakes. I’ve been drawing on my frozen supplies of Cherry Ripe cupcakes and Marmalade muffins. Since becoming a jam-making convert we have accumulated a rather large store of jams and marmalades which is proving too much to eat by ourselves. We give away a stack of preserves but when I make a really nice batch I struggle to give every last jar away – which is why our shelves look like this! This year I’ve resorted to making fewer preserves and giving even more away, but there’s still a backlog left from previous years. My latest ‘stash’ reduction plan is making marmalade muffins. Mix the dry ingredients together. Mix the eggs,milk,marmalade/jam and oil together in a separate bowl. Mix the contents of the two bowls together, so they are just combined. Cook at 200 degress C for about 12 minutes. This made 16 medium-sized muffins. If you are not feeding ravenous hordes, you can freeze some for later. Dinner was a bit of a rush as I was heading out to catch up with friends, so pasta filled the dinner bill. The sauce was based on our tomato passata (we made it but the tomatoes were bought from the markets), the garlic was at least homegrown, onions (from South Australia) and a bit of minced beef. Today was a busy day for us both so breakfast was again toast (homemade bread) and dandelion marmalade for me and apricot jam (own fruit and homemade) for TB. 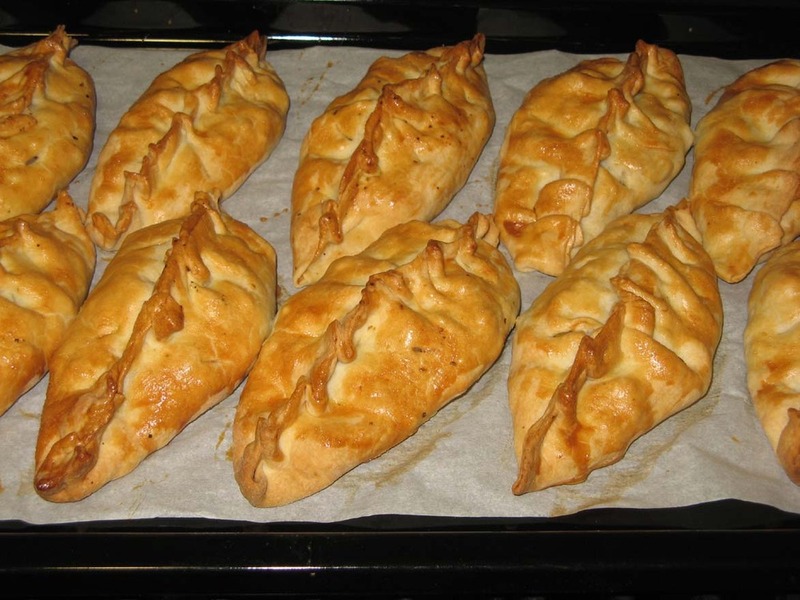 Lunch was very tasty but easy as we had pasties in the freezer. These were filled with our own carrots, potatoes and bought onions and a bit of random rump from the local shops. (PS this was when they were cooked, we only had one each for our lunch). The afternoon was spent re-potting some of our container plants, including the Meyer Lemon, Wild Lime and Lime/mandarin cross I bought last year. I was secretly happy to see that at least one lemon flower had escaped my vigilance when I removed the flowers earlier in the year – this is so the new plant develops a strong growth habit before bearing its first crop – so now I have my first lemon. Dinner was a more considered meal. 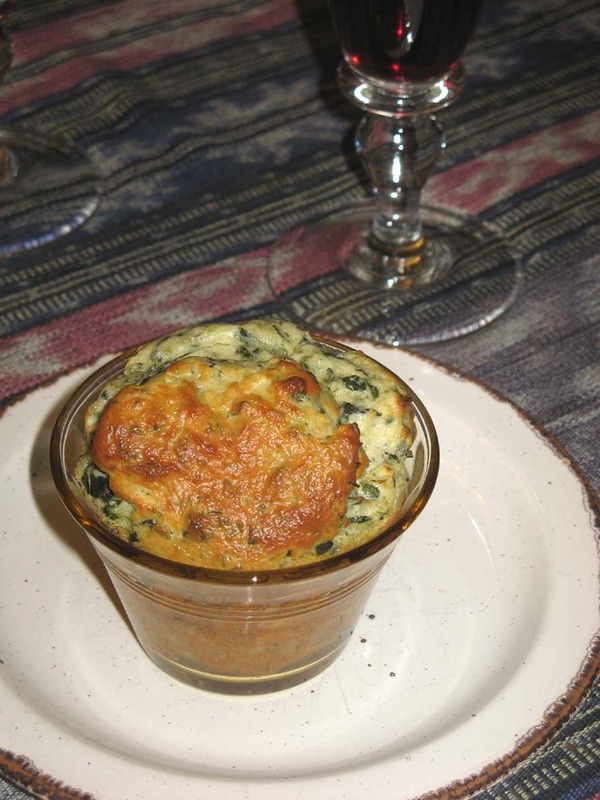 TB made Warrigal Greens souffle (eggs were from Murrumbateman, just over the ACT border) and our own Warrigal Greens. I love this native spinach it is so tasty. We will be using and harvesting it before the first frosts hit. 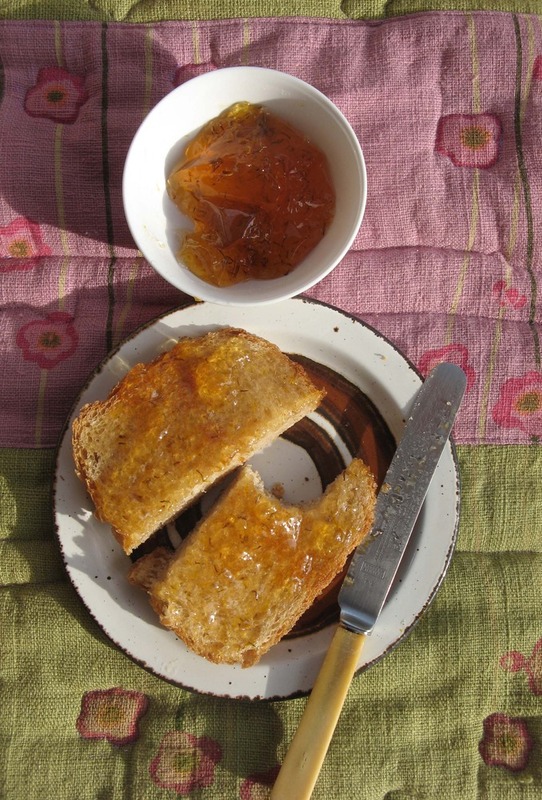 Day 2 started off with a breakfast of homemade bread and Dandelion Marmalade. I must say that the taste of the marmalade is predominantly citrus, which is perhaps not a bad thing as the leaves of the dandelion (used in salads) are on the bitter side. What the flowers do add to the mix is the beautiful colour of the marmalade. This marmalade falls into the ‘interesting idea’ category rather than one I would add to my ‘must keep making’ list. If you’d like to have a try at making it yourself you can find the recipe here. Lunch was a more pedestrian affair, a tomato and cheese sandwich. Well at least the tomato was home grown. I arrived back home to find that TB had outdone himself for dinner. For entree we had zucchini flowers stuffed with homemade ricotta cheese flavoured with some of the csabai sausage we bought on Sunday. The latter really gave the stuffing a tremendous smoky paprika flavour. 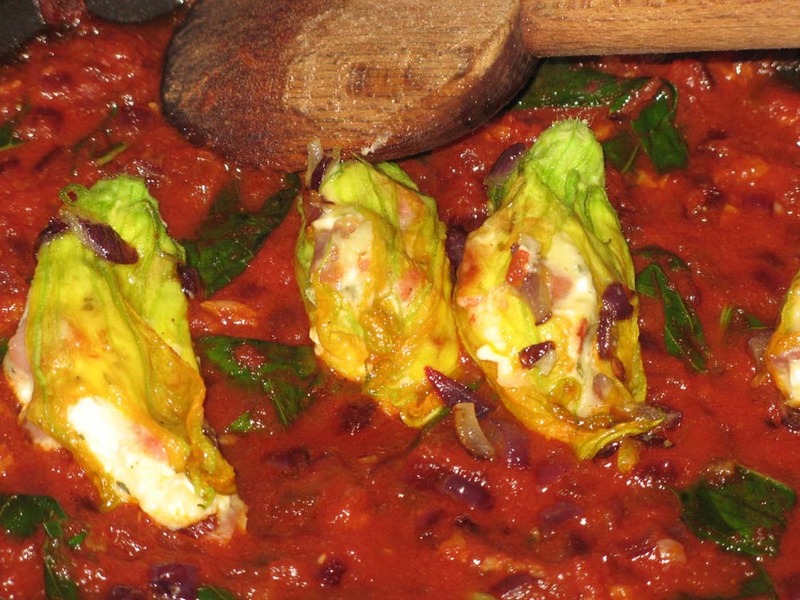 The flowers were then cooked in a sauce which used our own tomato passata and basil. 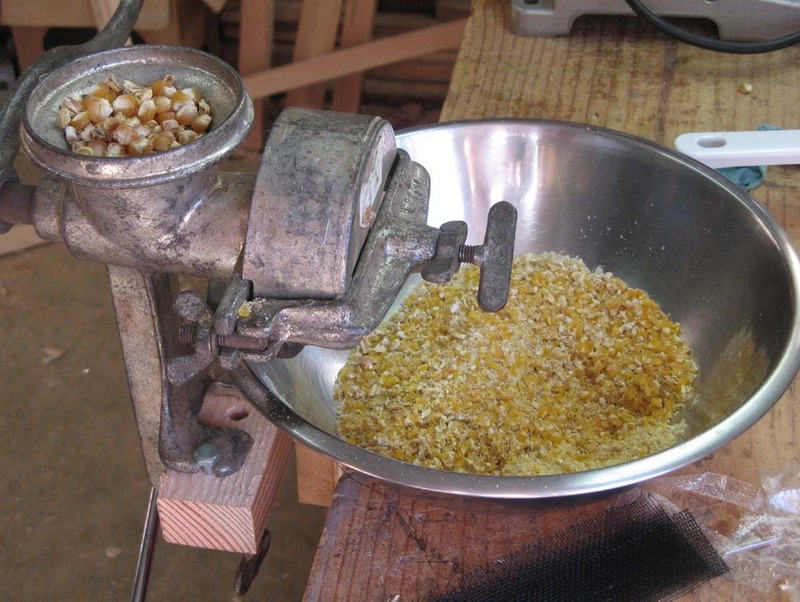 He also made cornbread, grinding corn from our own cobs with the hand grinder we found at Bairnsdale last year. Bolting the grinder firmly to the bench in the shed with the vice has made the grinding process much easier. The corn bread went with our home made beetroot soup (our own beetroots and carrots and home-made beef stock). Yum, I’ll be having more of these as left-overs for lunch tommorrow! What with the ending of daylight saving we are up early enough to cycle off to our local Southside Farmers Market, specifically to buy eggs and organic milk. It’s a great morning to be riding on Canberra’s cycle paths and we see several places where people have expanded their veggie patches out side their fences alongside the bike paths. However with several of our favourite suppliers not at the markets today we are out of luck with getting eggs from within the ACT. Instead we find another supplier from just over the border at Murrumbateman. Likewise there is no milk supplier here today either! Perhaps we should have opted for the 100 mile trial instead. At least our nearby towns are providing tasty food. We did get some Queanbeyan produced frankfurters and csabai from the Zivko’s van. When it comes to bakery goods we were at least able to get Canberra products – croissants for breakfast from Bush Breads of Australia and some yummy Creme Brulee pastries from Creme ‘n Suger for later. On the way back home we stopped to pick some dandelion flowers to complete the dandelion marmalade (as seen on River Cottage Everyday, a few weeks ago) that I’d started on Saturday night. 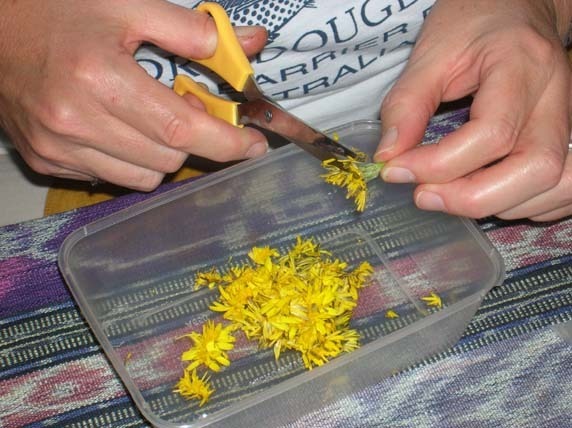 Cutting the dandelion petals – I think this is really an activity for princesses trapped in towers! The base for the marmalade is a mix of citrus (bought) and apples (feral picked) with some dandelion petals and water. This is then simmered for an hour before putting the mix in a muslin bag and leaving the juice to drip through overnight. On Sunday morning I made the marmalade by adding sugar to the juices and boiling until it reached setting point. Once I’d taken the jam off the heat I added the second lot of dandelion petals. Tasting the jam is scheduled for Day 2 of the challenge. 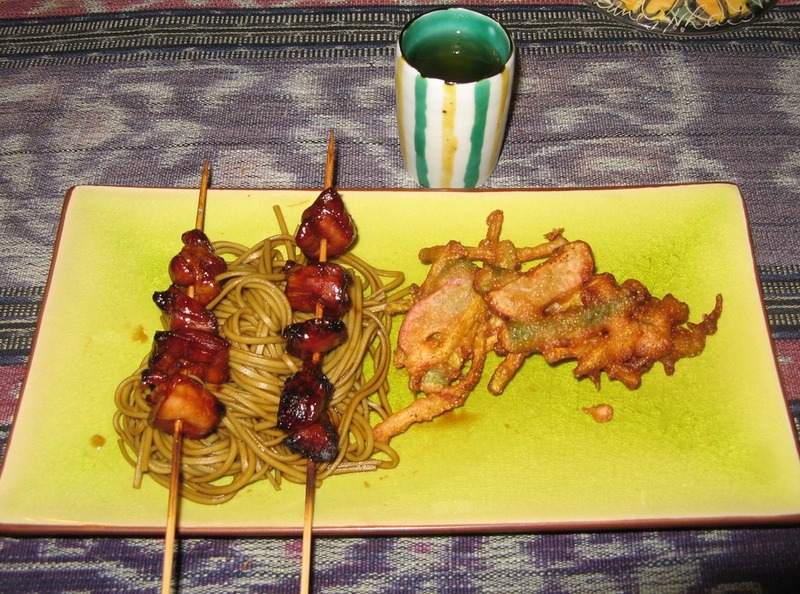 Dinner: Chicken yakitori with veggie tempura, homegrown carrot, beans and radish. Otto cheese (Bruny Island, Tas) with home made spicy apple and plum pastes.